“HOME!! !” Which is all that my diary says for that day. And plenty. Just out of curiosity, I put our itinerary into Google maps’ directions screen, and discovered that in 45 days, we went roughly 7600 miles, not counting side trips or out-and-backs. That equals roughly 180 miles a day. Which really doesn’t sound like much, until you think about it being the equivalent of 180 miles every single day for 45 days. When I was forty years old, I made what I still refer to as my Long Trip (uppercase intentional). I drove over 14,000 miles by myself in a little under three months. I went from here near Seattle across the top of the U.S. to Vermont, down the east coast to Florida, then across the South and Southwest to California, where I rolled my car in the middle of the Mojave Desert. I then managed to make my way to my sister’s home in the Bay Area and flew home from there. A year ago I blogged that journey day by day. Like our Alaska trip, this was another journey from which I still date events in my life. It was one of the best things I ever did. The really funny thing is, I drove an average of almost exactly 180 miles a day on that trip, too. And I thought I was being leisurely about it. I am hoping to make another Long Trip in a year or two, if I can afford the gas and figure out what to do with my two cats for the duration (for my last long trip, the pair I had at the time went to stay with a friend, but I don’t want to impose on her twice). This time I want to drive across the middle of the U.S. and come back across Canada. If I do, I hope to blog it in realtime, or as close as I can manage given where and when I can find wifi. Anyway, for all of you who stuck with me through forty-five days of driving to Alaska and back, I hope you’ll stick around to see where I’m going in the future. 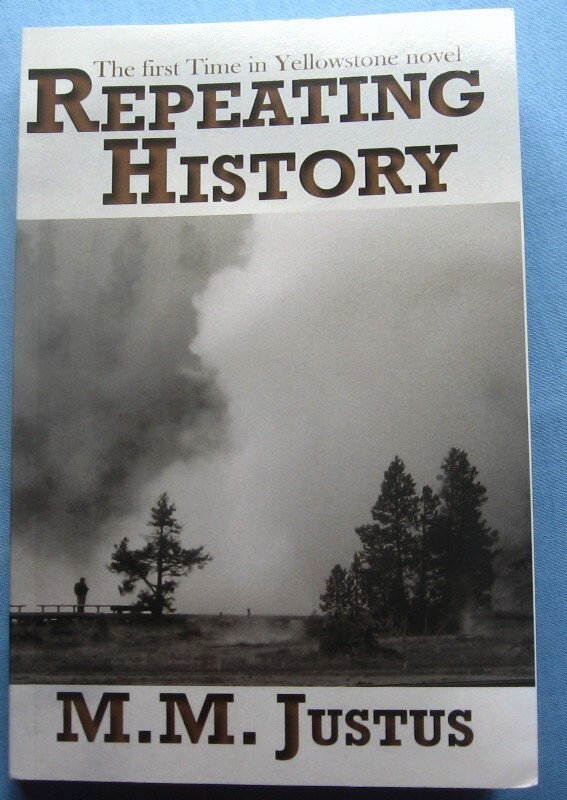 Repeating History is the first of my Yellowstone stories, and is available from Amazon, Smashwords, Barnes and Noble, and iTunes. 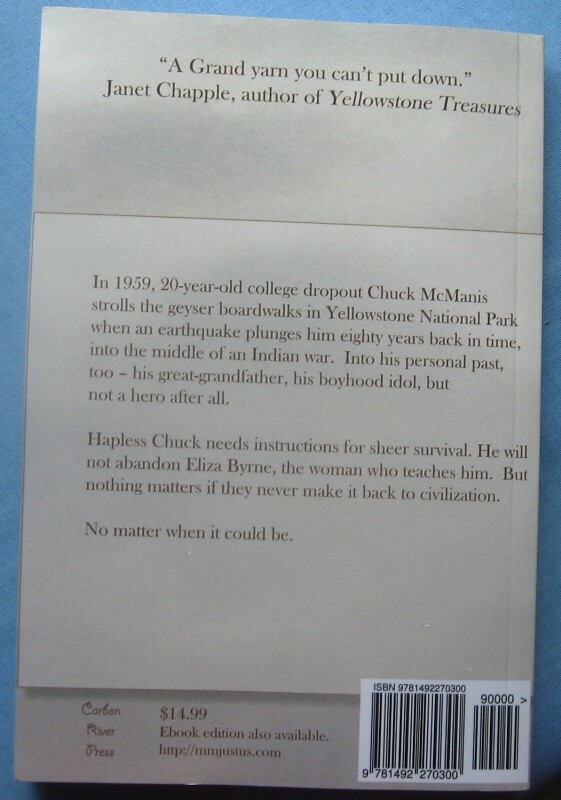 It is about a young man, Chuck McManis, who, by virtue of being in absolutely the wrong place at the wrong time, is flung back in time from 1959 to 1877 in Yellowstone National Park, straight into the middle of an Indian war — the flight of the Nez Perce to Canada, pursued by the U.S. Army — and into his own family’s past. True Gold is the second in this series, and picks the story up in the next generation. It is available through Amazon, Barnes and Noble, and Smashwords. It is the story of Karin Myre, a Norwegian immigrant teenager living in Seattle, who decides to escape a future of too much drudgery and no choices by running off to the Klondike Gold Rush in 1897. Stowing away on one of the many overcrowded ships bound north, she finds herself trapped in the cargo hold with a crowd of second thoughts. But her rescue from the captain and a fate worse than death by a determined young prospector from Wyoming and his photographer partner is only the beginning of her search for a future of her own making. The third novel, tentatively titled Finding Home, picks up the story of the widowed father Chuck left behind in Repeating History, his search for his lost son, and what that search reveals to him about his own murky past. It will be available for purchase in the spring of 2013. 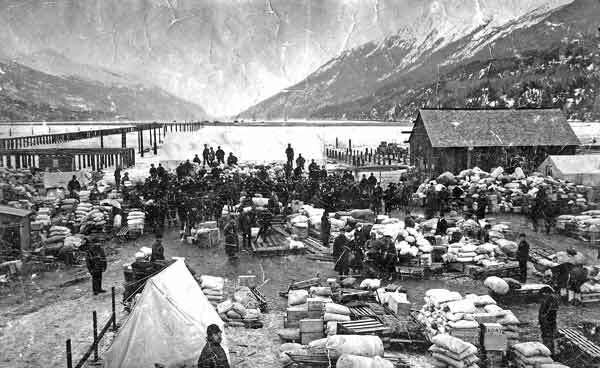 Today I’m over at Romancing the West again, with an article on the Klondike Gold Rush. I’d love some company there, if you’d like to read and comment. We had been rained on before during this trip, mostly the kind of weather we here in the Pacific Northwest refer to as showers and sunbreaks, but on this day it literally poured all day long. As my diary says, we got a late start, and we almost didn’t travel at all that day. 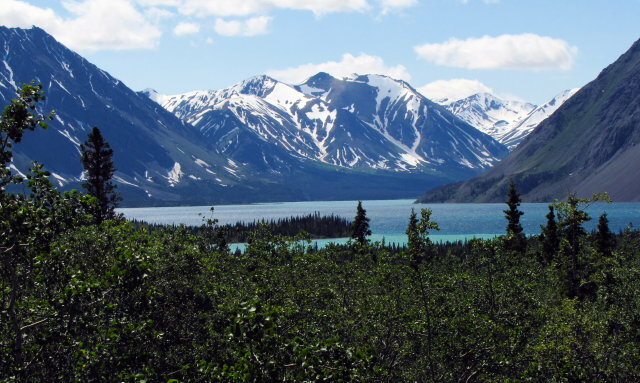 But at last we decided to go on, and drove south on the Alaska Highway to the small community of Haines Junction, where the highway south to Haines, almost at the top of the Alaska Panhandle, starts. Nowadays you can drive from Whitehorse to Skagway on a paved highway that follows the old White Pass and Yukon Railroad route. The railroad was built during the Klondike Gold Rush, and went into service a little over a year after True Gold‘s heroine Karin and her companions climbed over the Chilkoot Pass from the now-ghost-town of Dyea, just across Lynn Canal (not a canal at all, but a natural channel) from Skagway. A historic photo of the Chilkoot Pass, as it would have looked when Karin climbed it. We stopped in Haines Junction for gas, and went another thirty miles to a lake with a very odd name, Dezadeash, where we spent the afternoon in the trailer, playing a lot of cards, and listening to the rain pound on the roof. Dezadeash Lake, in much better weather than what we saw it in. True Gold, my second published novel, is now available on Amazon and Smashwords. Stowaway. When Karin Myre, a young Norwegian seamstress’s assistant from Seattle, gets caught up in the excitement of the steamer Portland‘s arrival with the first ton of riches from the Klondike Gold Rush, she decides to escape a future of too much drudgery and no choices. Sneaking on board of one of the many overcrowded ships bound north, she finds herself trapped in the cargo hold with a crowd of second thoughts. But her rescue from the captain and a fate worse than death by a handsome prospector and his photographer partner is only the beginning of her search for true gold. This book is a sequel of sorts to my first novel, Repeating History, the second volume in a projected three-generation saga, but can also be read as a standalone novel.